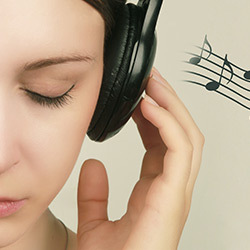 Neurologic Music Therapy is an effective tool which can help with brain injury rehabilitation by improving clarity of speech and breath control, improving attention and focus, assisting with coordination, strength and balance as well as providing an opportunity for self-expression and mood elevation. Chiltern Music Therapy work with children and adults who have suffered a brain injury or have been diagnosed with a neuro-disability. Throughout 2019 we’re supporting Chiltern Music Therapy’s iPod Pharmacy, an initiative set up to recycle old iPods, iPod Shuffle and iPod Touch, which are cleaned, uploaded with personalised music, and lent to those receiving music therapy. Whether in a hospital setting or a care home, donated iPods will be used to help people relax, lift their mood, take a person’s mind away from painful procedures or cancer treatment and give someone the opportunity to reconnect with favourite songs and positive memories. James has a brain injury and can often become very distressed and agitated. He lives in a supported living facility and was referred to a weekly neuro music therapy group to help improve his mood. When he takes part in music-making or singing along to his favourite music, his mood completely transforms. He becomes more aware of his surroundings and communicates with others more – smiling and laughing. To support this positive change throughout the rest of the week, James’ music therapist has recommended he receives an iPod from Chiltern Music Therapy’s iPod pharmacy. The music therapist has worked closely with James, his family, and the support staff to create a personalised playlist of his preferred songs and music, which all help him to relax and stop him feeling agitated during any periods of distress. The home is now able to offer James the opportunity to listen to his playlist whenever he is having a difficult day and help him to re-connect with himself, those around him and the music he loves. Sam was referred for neuro music therapy after sustaining a severe hypoxic brain injury from a failed suicide attempt. Sessions focus on supporting Sam to redevelop speech and strengthen his mobility, as well as provide him the valuable emotional support he needs as he adapts to life post-injury. Whilst he has a supportive therapy and care team in place, he requires round the clock care and does not regularly have the opportunity to be by himself. In collaboration with speech therapy, Sam has developed reliable use of a communication book to support him to express himself. To involve Sam in an enjoyable, engaging, and purposeful project, the music therapist worked with Sam over several weeks, supporting him to use his communication book to share his response to different tracks and create a playlist of his favourite songs. Through Chiltern Music Therapy’s iPod pharmacy, Sam now has his own individual iPod and can access an enjoyable private listening experience whenever he wants. Chiltern Music Therapy’s iPod Pharmacy – How can you help? Throughout 2019, we’re encouraging delegates attending our training conferences and events to have a rummage through their drawers and cupboards at home and bring along to the training any unused iPod, iPod Touch or iPod Shuffle to donate to Chiltern Music Therapy to support their iPod Pharmacy. And if you aren’t attending any of our events during 2019, donations can be sent to our office, or directly to Chiltern Music Therapy. In addition to iPods, iPod Shuffle and iPod Touch, Chiltern Music Therapy also need to add personalised music to each iPod, so perhaps you could support the scheme by helping purchase songs? Donations can be made by cheque, payable to Chiltern Music Therapy. A donation of just £10 creates a playlist for one client. For every iPod donated, Yamaha are donating a new pair of headphones. Donations of iPods, iPod Shuffles and iPod Touch, as well as donations towards playlists, will be accepted at the registration desk of each of our 2019 events. You can find more on Chiltern Music Therapy, in our Services Directory.